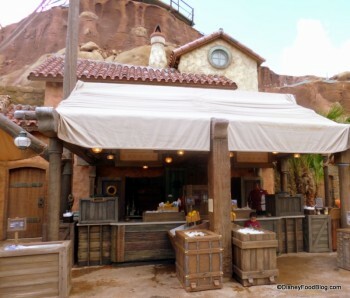 Prince Eric’s Village Market is located at the base of the Seven Dwarfs Mine Train in New Fantasyland and it’s a great spot to grab a quick snack at any of time of the day! The Market sells bottle beverages, “better for you” snacks, and shave ice. Fresh fruit, juices, bottle water, frozen lemonade, and turkey legs are just a few of the items on the menu. No longer serving Shaved Ice. Prince Eric’s Village Market blends in to the mountain for the Seven Dwarfs ride, so it’s easy to miss!